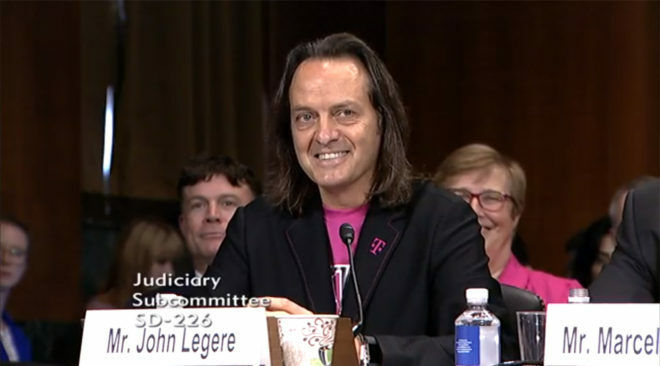 Next month, John Legere and Marcelo Claure will once again testify in front of a subcommittee regarding the merger of T-Mobile and Sprint. The House Committee on Energy & Commerce and House Judiciary Committee will hold a joint hearing on the T-Mobile-Sprint merger on February 13. The complete list of hearing participants is still being confirmed, but both T-Mobile CEO John Legere and Sprint Executive Chairman Marcelo Claure have agreed to testify. This is the second time the execs have testified regarding the merger, after appearing in front of a Senate antitrust subcommittee in June 2018. The hearing is meant to examine the T-Mobile-Sprint merger’s potential impacts on consumers, workers, and the wireless industry as a whole. It was announced by Energy and Commerce Chairman Frank Pallone, Jr. (D-NJ), Judiciary Chairman Jerrold Nadler (D-NY), Energy and Commerce Subcommittee on Communications and Technology Chairman Mike Doyle (D-PA) and Judiciary Subcommittee on Antitrust, Commercial and Administrative Law Chairman David N. Cicilline (D-RI). T-Mobile and Sprint have said that they expect their merger to be completed in the first half of 2019. The deal has received approval from the Committee on Foreign Investment in the United States and was cleared of any national security, law enforcement, or public safety issues by the U.S. Department of Justice, Department of Homeland Security, and Department of Defense. The merger is still being reviewed by the FCC and must be cleared of antitrust issues by the DoJ. those customers will not have any option if merge happens ! also a lot of JOBS gone. The MVNO’s aren’t going anywhere and prices probably won’t be increasing. Postpaid 5G coverage will certainly be more expensive and that was going to happen regardless of the merger. MVNOs lease lines from T-mobile and Sprint. When their lease prices go up they will pass on increase to their customers. 90% of post paid customers use Sprint and T-mobile network. Prepaid and MVNO’s make up 23.5% of the wireless market. They make up even more of the market on the T-Mobile and Sprint networks. No one knows what will happen after the merger but wholesale airtime is so cheap that Comcast literally gives it away on the Verizon network for crying out loud. On the wholesale side of things you should see very little movement in price. It is all about data. And data will remain cheap as they’re selling excess capacity. A lot of jobs would be lost if they don’t merge as Sprint would simply become an unviable competitor that dies over time and T-Mobile would take years to be on the same plane as the big 2. Combining the companies may not be ideal but it’s the only logical step as we make the very capital intensive and expensive switch to 5G. If Sprint were to die, wouldn’t its customers have to go somewhere? Maybe like Tmo. Plus when companies merge they pay for the merger by laying off employees – not hiring new ones. There are cost efficiencies to be had by laying off overlapping positions, yes. But the value of the merger in this case is Sprint’s spectrum licenses and the ability of the two companies to compete on scale. It’s not about cost savings. There is no way for T-Mobile to accumulate enough assets otherwise to fairly compete with Verizon or AT&T. Your comment about how to pay for the merger is too simplistic. They can pay for the merger through combined cash flow generation and growth. Laying off a few thousand employees would be nothing compared to the cost of a merger. There would also be more jobs created through the merger itself and the infrastructure build out and consolidation that would take place. Right. AT&T too said that T-mobile will go bankrupt leading to job losses. I did not buy it then, I don’t buy that lame excuse now. AT&T also had a breakup clause with T-Mobile in case the merger failed and it did.. that breakup clause included Cash and Spectrum. when the merger failed john came on board and took all that and rebuilt T-Mobile into what we have now. there is no breakup clause with Sprint other then a roaming agreement. That is such a very ignorant and untrue statement. This is not a merger. T-mobile is essentially buying off Sprint and will own more than 25% of Sprint. This is all about making Mr. Son’s investment in Sprint whole. Mr. Son has of course gone and praised Mr. Trump at Trump towers. In the 150 page report, not one line about the impact of T-mobile’s acquisition on MVNO customers. T-mobile and Sprint provide service to the bulk of prepaid customers. T-mobile Germany majority owners of T-mobile USA are not buying Sprint for no reason. This will lead to job losses, lead to higher prices. Remember T-mobile and Sprint are the leaders in price reduction, not Verizon and AT&T. Expect higher prices after the “merger”. Google Fi and other third party providers that use T-mobile network will be forced to increase their prices. T-mobile has sold this as a need for 5G spectrum. There is nothing stopping them from leasing/sharing spectrum like in every other country in the world but the US. TMobile’s own filings with the government said that prices will rise. Do you have a link to that specific filing language? Tmonews won’t let me post the link. But the document states that the combined firms will compete for customers based on “quality-adjusted” prices – not that there’s anything wrong with that. The $40 billion the combined companies plan to spend on 5G has to come from somewhere. Thank you! After reading through it, I would disagree with your comment above on what they said or insinuated on prices. It certainly may happen (higher prices), but it isn’t a given. That said, if they do, and if the 5G speeds do what’s expected, I could easily dump my cable, etc and ultimately save money. Hard to do at speeds I’m seeing now. We’ll see…as I predict the merger will happen. Good day. I hope the merger fails. We need competition for innovations and to keep prices low. BWAK! BWAK!……….the sky is falling. John has already stated that the deal includes hiring more people. New things are always scary…..y’all will adapt. Plus, on the bright side, my wife will have a better signal with T-Mobile running things.